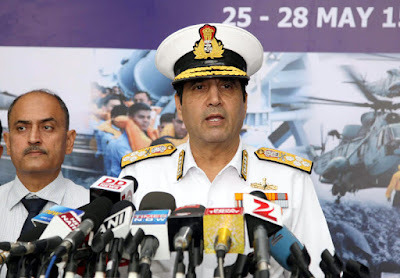 The Chief of Naval Staff, Admiral R.K. Dhowan addressing the top Naval Commanders at the concluding session of the Commanders’ Conference, in New Delhi on May 28, 2015. The first edition of this years’ bi-annual Naval Commanders' Conference was conducted at New Delhi from 25-28 May 15. 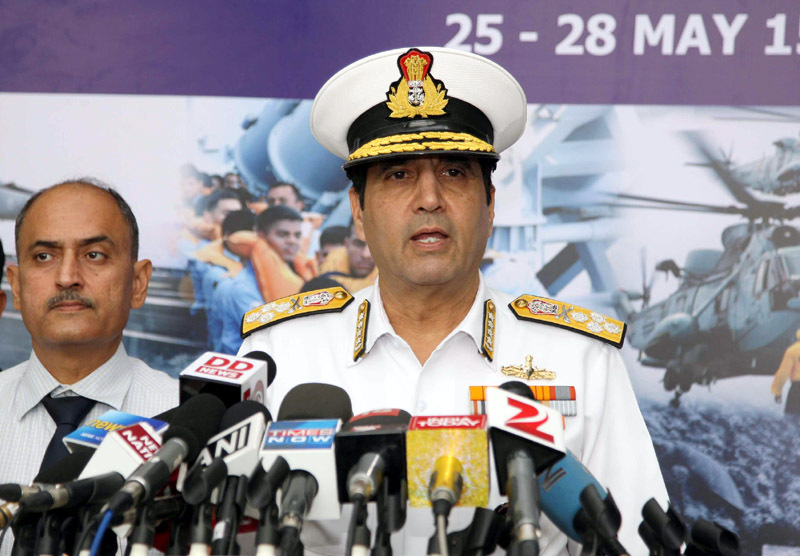 Chief of the Naval Staff Admiral RK Dhowan chaired the conference and addressed the Navy’s top leadership on myriad issues including enhancing operational readiness of the Commands, infrastructure development, human resources management, coastal security, cyber security in the Indian Navy and foreign cooperation initiatives, amongst others. Emphasising that combat readiness of the fleet and other operational formations is of prime importance and focussed efforts, as hitherto, are required at all levels to ensure sustained growth of the Navy into a formidable multi-dimensional force, the Admiral complimented all ranks of the Navy in maintaining a high tempo of operations during the last six months, including the response shown during the fresh water crisis in the Maldives and evacuation of people of various nationalities from Yemen. One of the focus areas discussed during the conference was the induction of manpower, aspects pertaining to training and skill development, and welfare of personnel. Consequent to 2015 being observed as the ‘Year of the Sailor’ in the Indian Navy, service conditions of sailors and their quality of life (including post retirement placements, accommodation and hospital facilities etc.) were deliberated extensively. The CNS stated that our men and women are our greatest assets and their morale and well-being should always remain of primary concern. The men and women behind the machine are the Navy’s greatest strength. They need to be viewed and harnessed as such at all levels. The indigenisation programme of the Navy was discussed and the CNS stressed that indigenisation of platforms, weapons, sensors and equipment, through DRDO, public and private sectors as also through in-house efforts, should remain an area of focus. He emphasized that the ‘Roadmap for the Navy’s expansion and growth would continue to remain anchored on Self-reliance and Indigenisation’. He also urged the naval designers and technical officers to work in close coordination with DRDO so as to develop niche technologies for the future Navy. During the course of the conference, the CNS released the Maritime Infrastructure Perspective Plan (2015-27) and reviewed progress of various infrastructure projects that are in the pipeline and shall contribute towards capacity building. The need to adopt sustainable green technologies, re-cycling and waste management to reduce carbon footprint of our bases, in pursuance of the energy goals of our country as also to have ‘zero carbon footprint’ were also stressed by the CNS. An integrated roadmap and action plan to develop ecologically sustainable infrastructure was also released by the CNS. Plans for conduct of International Fleet Review and induction plan for Scorpene submarines were also reviewed by the CNS. Consolidation and strengthening of the rapidly expanding aviation arm of the Navy was discussed. Deliberations were also held on infrastructure and manning requirements for new induction aircraft, including Unmanned Aerial Vehicles and enhancement of surveillance in our area of interest. The CNS reviewed the 'coastal security construct' and was satisfied with the steady progress made in strengthening the coastal security apparatus viz. induction of FICs, ISVs and NC3 I project. He asserted the need to remain ever vigilant and focussed towards our coastal security responsibilities, through proactive coordination with other maritime agencies and coastal states. Deliberations were also held to strengthen ‘Cyber Security in the Indian Navy’. Various proposals from the Indian Navy have been forwarded for consideration of the 7th CPC to ensure that the aspirations and expectations of Indian Navy personnel, along with the difficult conditions of service on board operational platforms are recognized. A comprehensive review of proposals forwarded to the 7th Central Pay Commission which included conditions of service and emoluments paid to the Armed Forces personnel was undertaken by the CNS during the course of deliberations. One of the highlights of the conference was the opportunity naval commanders' had to interact with the MoD officials and the other service chiefs, wherein issues pertaining to joint operations and military synergy were discussed. In his closing address the CNS complimented all personnel of the Indian Navy for their professionalism and patriotism, and exhorted them to prepare themselves and the Navy to meet all future maritime security challenges before the country. Operational consideration should remain our collective focus in the coming years, he said. The Navy’s role is not only vital for national security, but also for national prosperity and development, he concluded. In a first of its kind, Admiral RK Dhowan, CNS, today inaugurated the ‘Conclave of Chiefs’ on the sidelines of the Naval Commanders’ Conference. 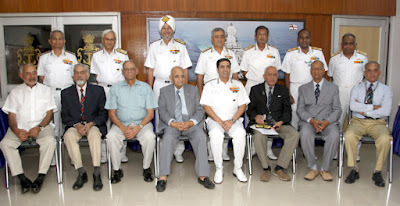 The meeting, included for the first time as part of the naval calendar, provided an opportunity for the former Chiefs to interact with the Commanders and other Senior officers and be apprised with the latest developments in the Indian Navy and its future plans. A key take away from the Conclave was the guidance and views that the erstwhile Chiefs had on a myriad of issues. It was intended to take advantage of their experience, knowledge and collective wisdom to chart the path ahead for the Indian Navy. It is on record that each former Chief played an important role in shaping the Navy and today’s Indian Navy is a result of the collective effort put in by this extended naval family. Besides being a reunion of sorts, a broad overview of the numerous progressive steps being taken on operational, material and personnel issues by the Navy; was also presented during the Conclave. The ex Chiefs were also provided a perspective on the achievements of the Service and the future plans anchored on the ‘Make’ in India’ initiative. The spouses of the Chiefs were given an overview of the efforts of the Navy Wives Welfare Association and the efforts of the Indian Navy in the areas of community welfare and development, particularly with regard to the naval families.